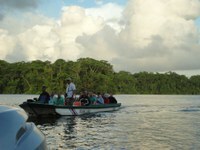 Tortuguero National Park is a true natural habitat. Tortuguero, or Turtle Catcher, is only accessible by Air or Water. 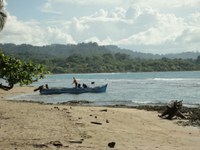 It contains over 120 sq miles of nature and 25 miles of Carribean Coastline. This allows for the a wide variety of animals. These include 4 plus distinctive varieties of turtles including the Green Sea, Leatherback, and Hawkspill, and Loggerheads. If you visit the park in certain months it is possible to see the turtles hatch. The Lezatherbacks are mainly in the spring while the Hawksbill and Green Sea Turtles nest from late summer to early fall. The park is also home to almost then 400 species of birds including a variety of parrots and toucans.